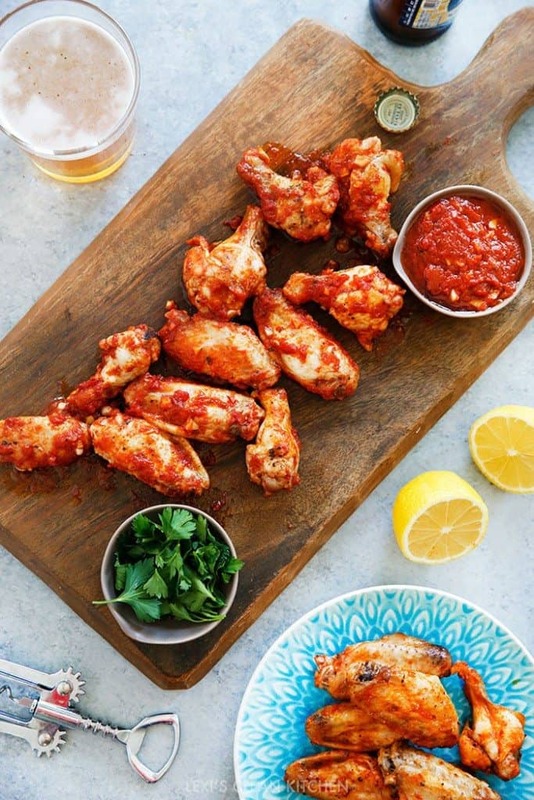 These Baked Saucy Garlic Wings are the perfect addition to your Superbowl party, or tonight’s dinner! 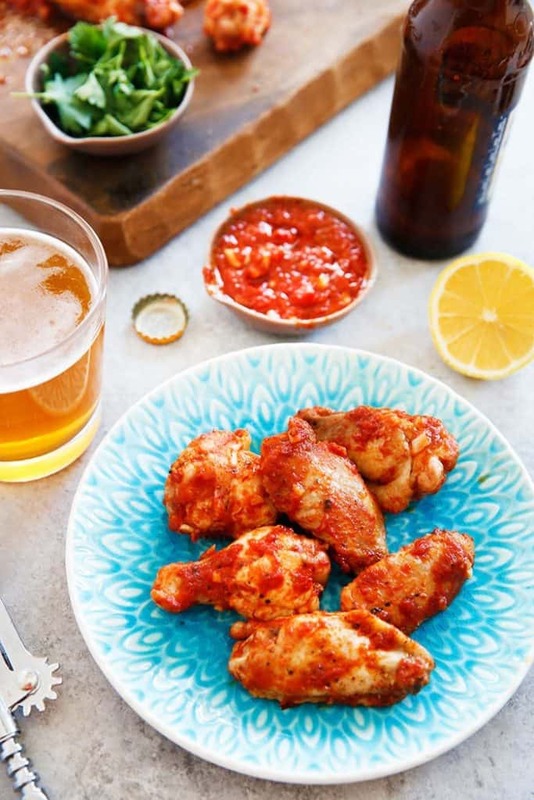 Slather on the garlicky, delicious sauce for some crowd pleasing wings! First, let’s chat a bit! 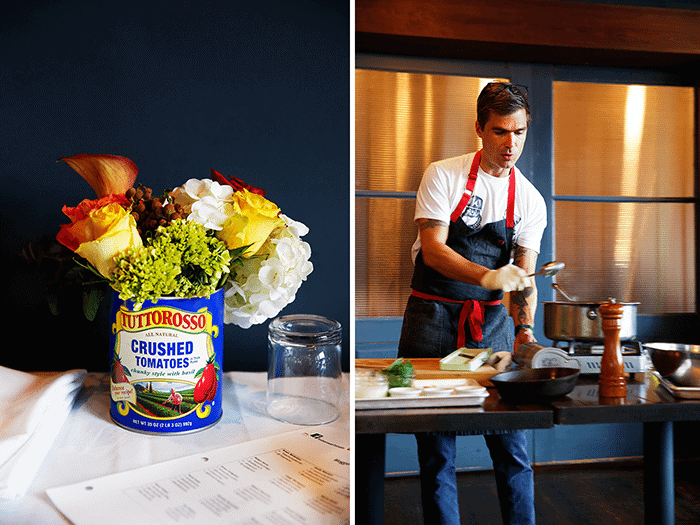 Remember a few months back I was in Atlanta with some bloggers for a fun Tuttorosso event with Chef Hugh Acheson? Well, at the event, the Tuttorosso ladies set up a canned tomato tasting and we were all mind blown. Quite literally. 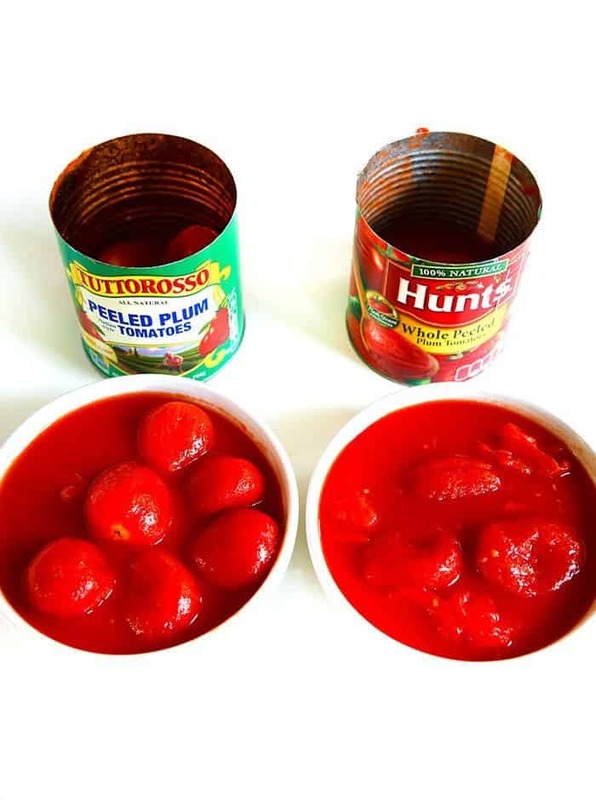 I’ve never taste-tested canned tomatoes, because it’s not a typical thing to eat out of a can, and oh my, you guys….There is such a difference it’s really just insane. Between texture, flavor, appearance, color, and so much more. It really is interesting to check out. SO, I decided to do a little experiment at home to show you. 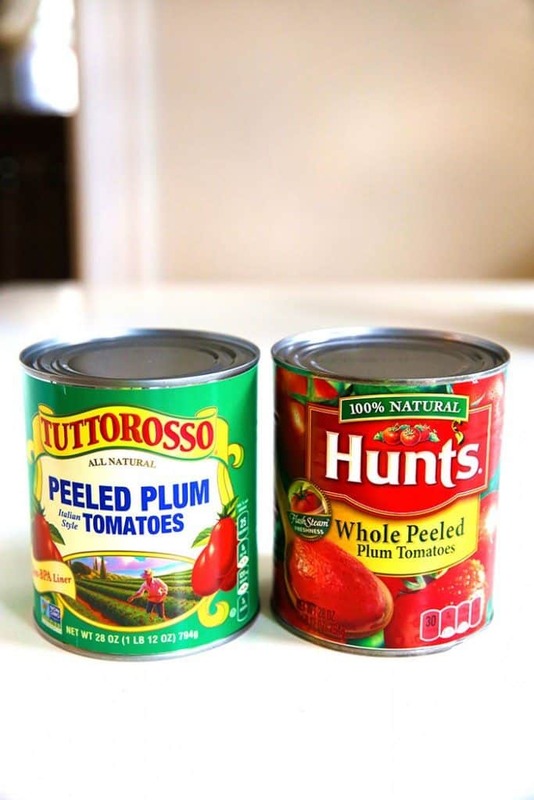 We have two different cans, same type of tomatoes (whole, peeled plum tomatoes). I cracked open the cans (not literally cracked), but you get the idea. Just look at the difference between these two tomatoes. I wish you could have been in the kitchen with us when we did our little taste test. Tuttorosso’s tomatoes were hands down the freshest, tastiest, and were uniformed (as you can see). The Tuttorosso can had no peels in the sauce, no taste from the can, etc. 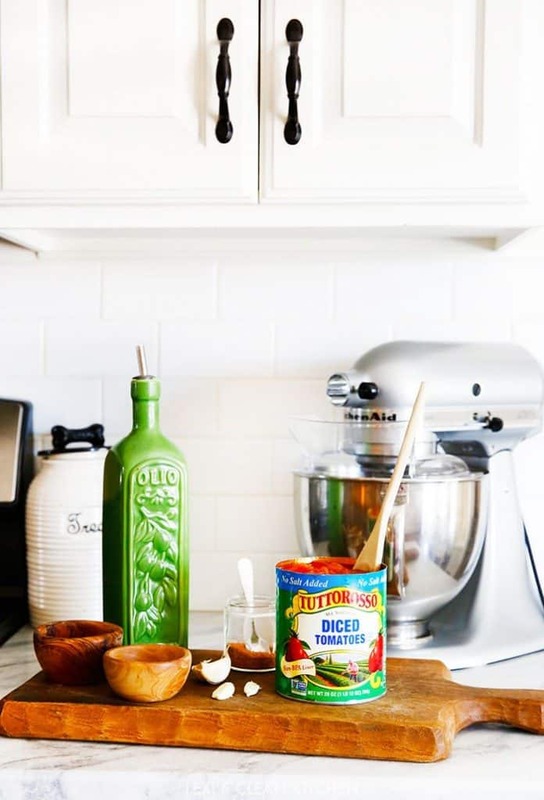 Canned tomatoes are used so often in recipes, and for good reason, so it definitely is a fun little experiment to try at home so you can really taste and see the difference in the canned tomatoes you are using! The Superbowl is right around the corner. For good measure and for some good taste-testers, I made these wings for last’s week championship game and everybody loved them! They are perfectly cooked. 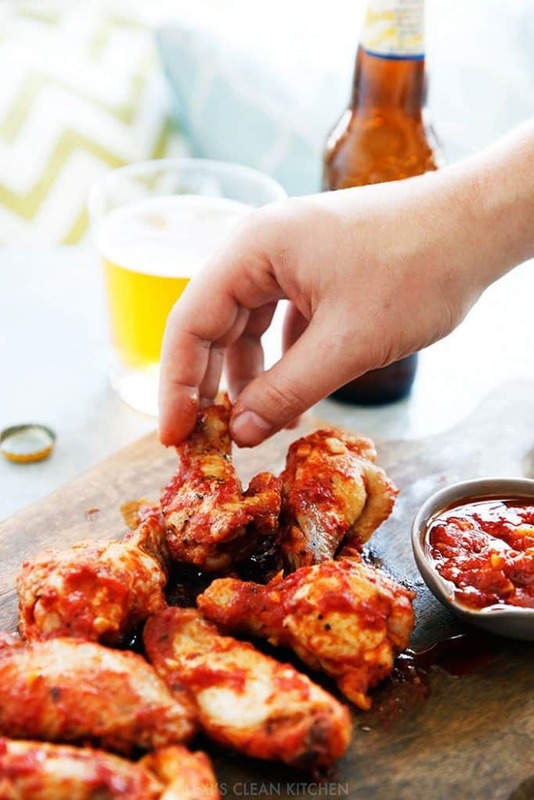 Saucy, garlicky, and finger-lickin’ good. Grab one off the screen, go for it! This post is sponsored by my friends at Tuttorosso Tomatoes. All opinions are 100% my own! 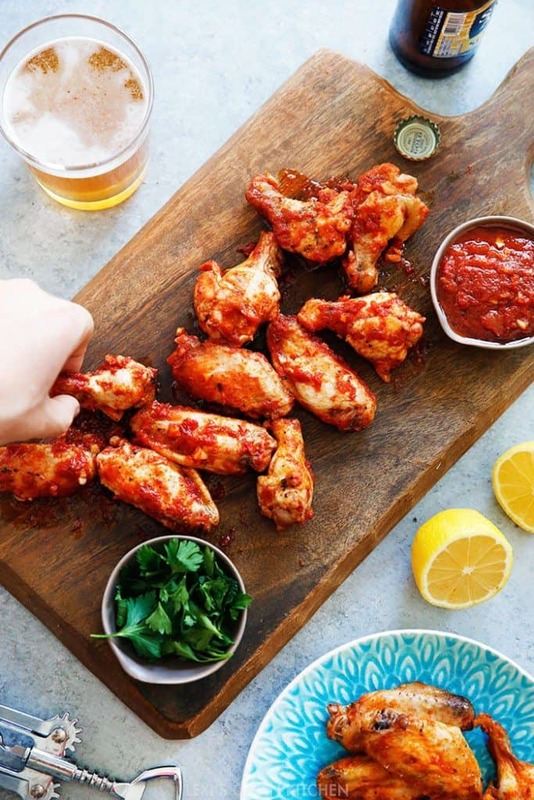 Favorite wing flavor- ready… GO! 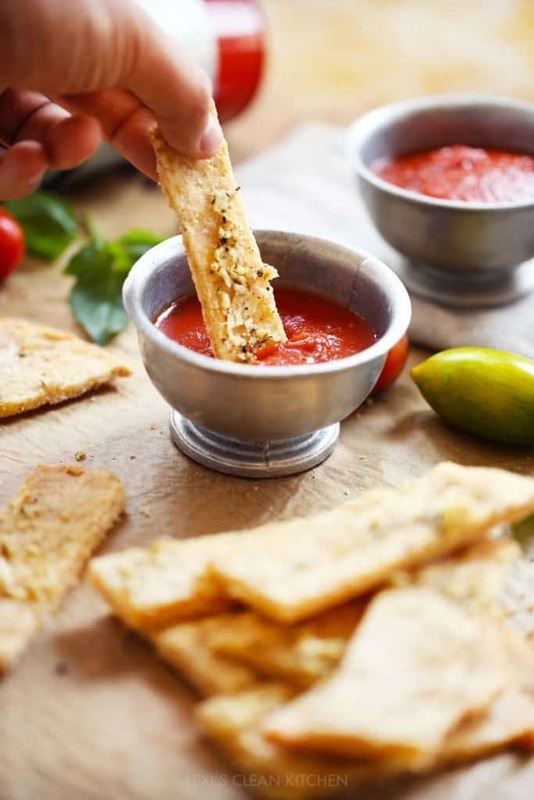 *Can use sauce in the whole or diced tomatoes, or blend up 1 cup of the tomatoes. I refuse to officially move into Fall recipes just yet, my friends. After all it’s a cool 95 degrees out today here in Boston! Bloggers like to get ahead of the game though. I won’t give up our summer just yet, but we’ll make a nice yummy transition, that’s for sure. Ready or not, the new school year is upon us, and there are some areas of the country where school is already back in session! …because I know how hectic those days can get. Whether you are a parent juggling your kids’ homework and 75 after school activities, or whether you are simply busy with your job and life, we all need a little easy in our lives. 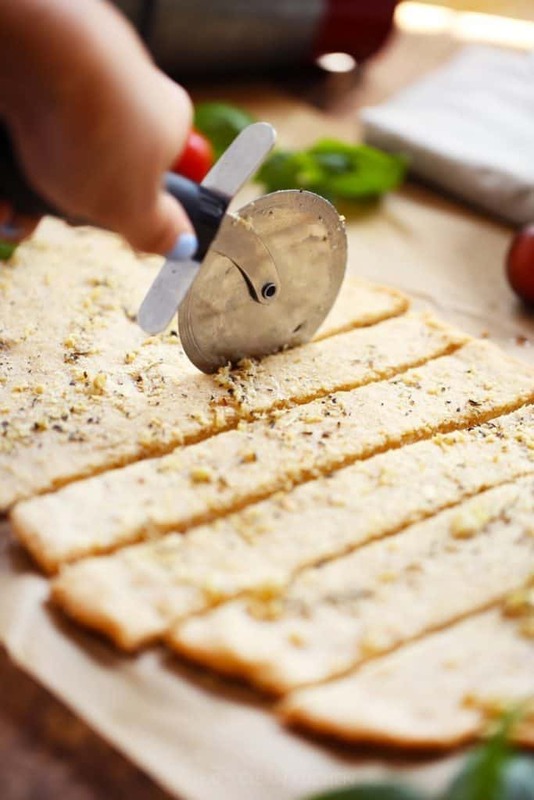 Easy and delicious that is. 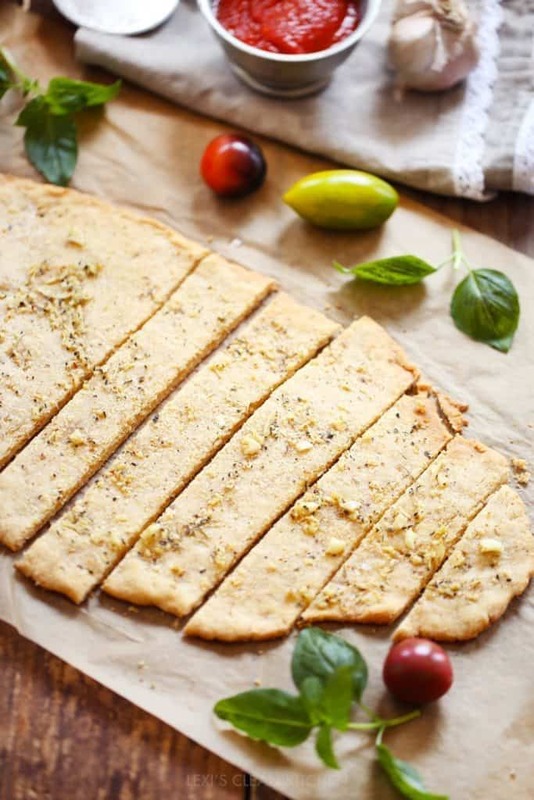 This week for Healthy Food Friday with American Express, let’s roll out the carpet for garlic breadsticks. 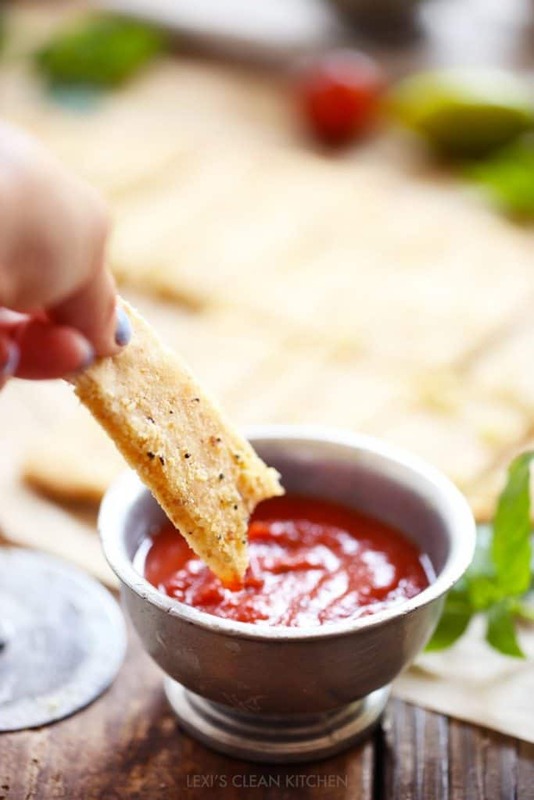 Bake, slice, dip, eat. Repeat. 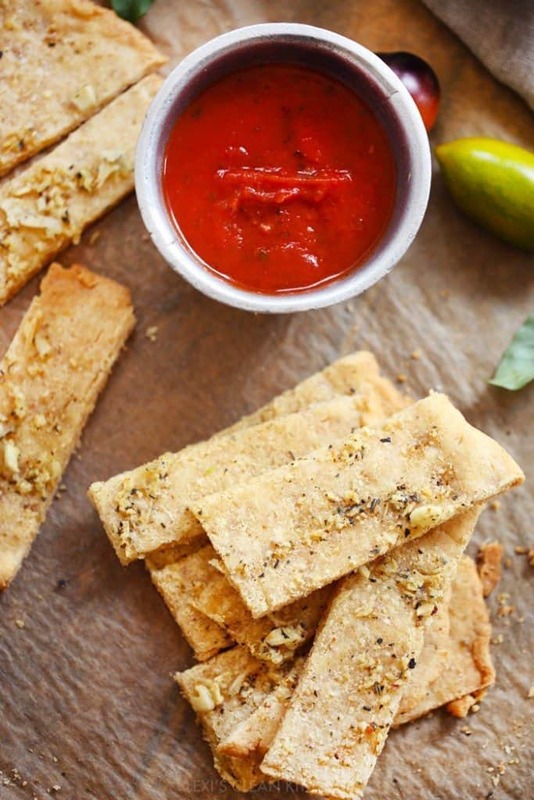 A meal, side or snack everyone will love. Promise! I’m not ashamed at how quickly we devoured these. Not even a little bit. What meal is the hardest for you on busy days? Lunches? Snacks? Dinners? January is here and with that comes new goals, resolutions, and tons of healthy eating/detoxing from the holidays! Are you in the same boat? 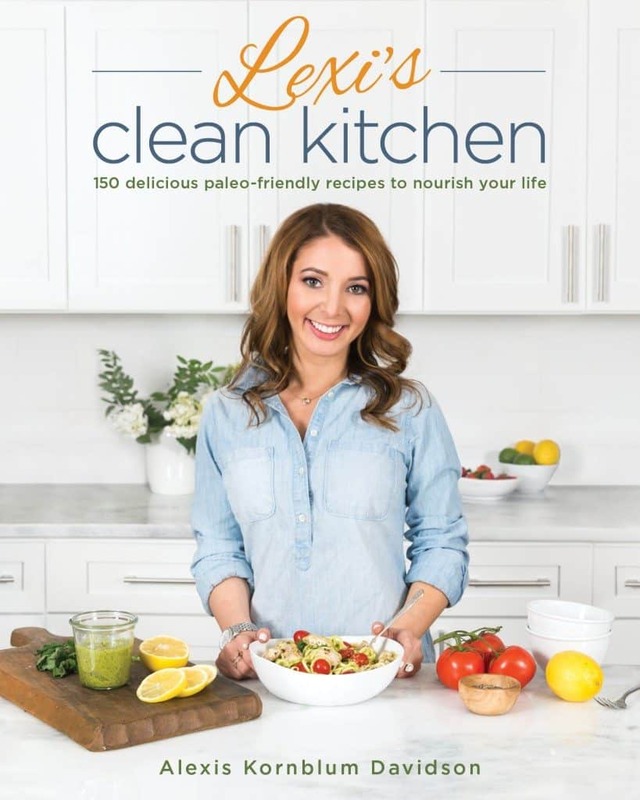 I’m doing a combination of a candida detox/whole30/21dsd! 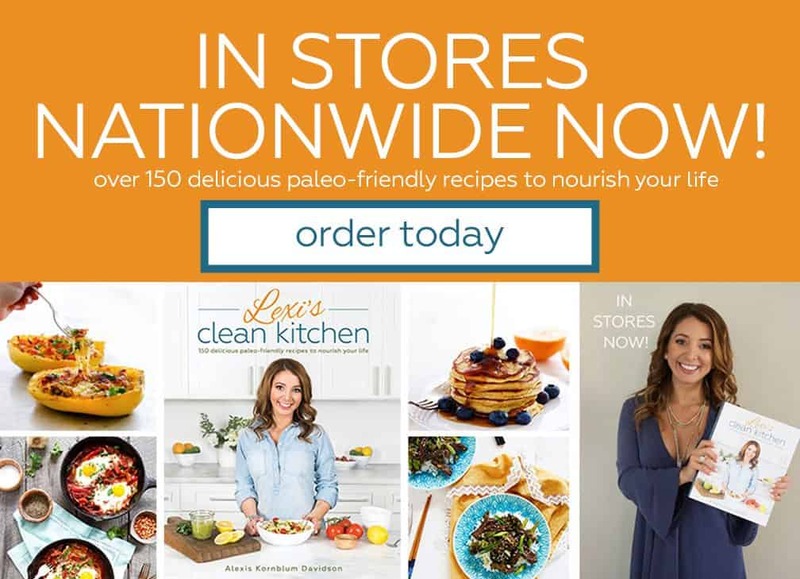 Basically, low/no sugar, real whole foods (no paleo baked goods), and lower carb. I’ve heard from many of you that you’re doing similar programs, and whether you’ve started one or are just trying to start off the new year on the right note, this post is for you! I made you possibly my new all-time favorite dinner. 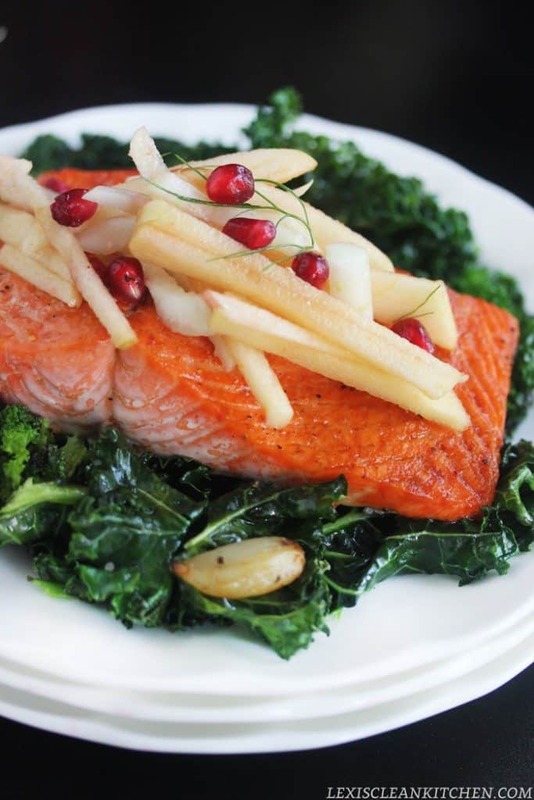 This Roasted Salmon dish is the perfect light & healthy dinner option that’s packed with your favorite winter flavors! 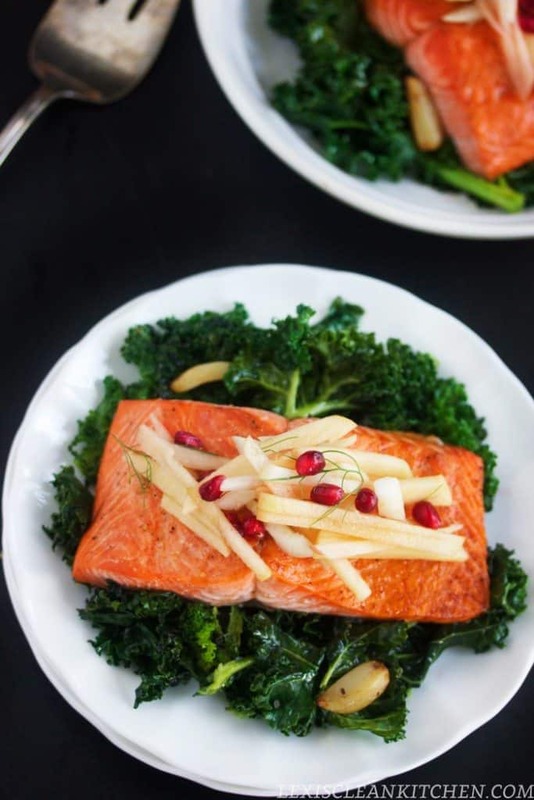 Paired with sautéed garlicky kale and topped with an apple fennel salad, it’s easy enough for a weeknight dinner and elegant enough to impress your weekend guests! But first… I’ve teamed up with the ladies for another month on great eats. 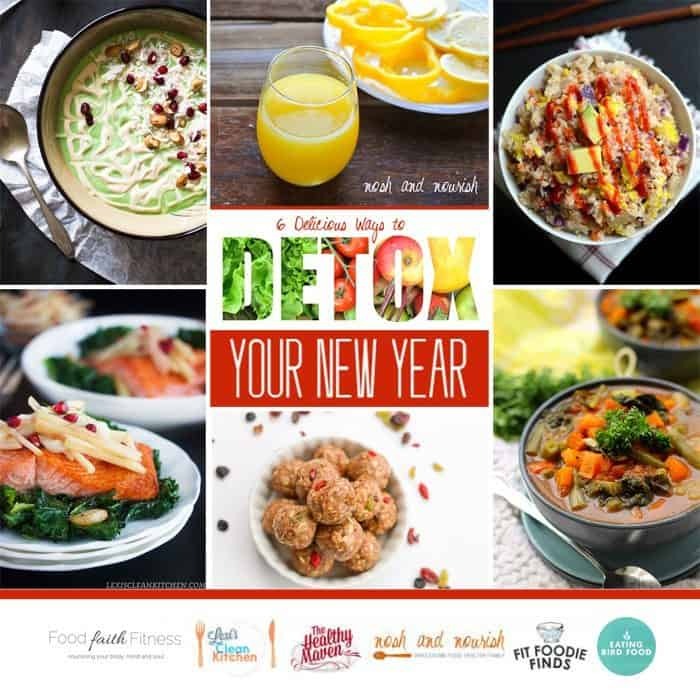 This month focusing on detox-friendly food to nourish and kick-start your 2015. 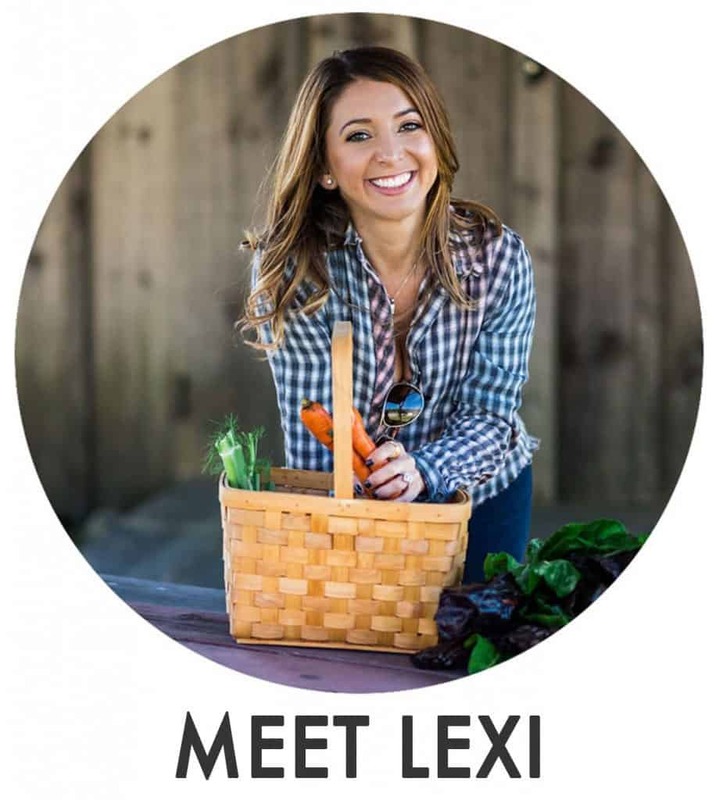 Please welcome Brittany from Eating Bird Food to the group! 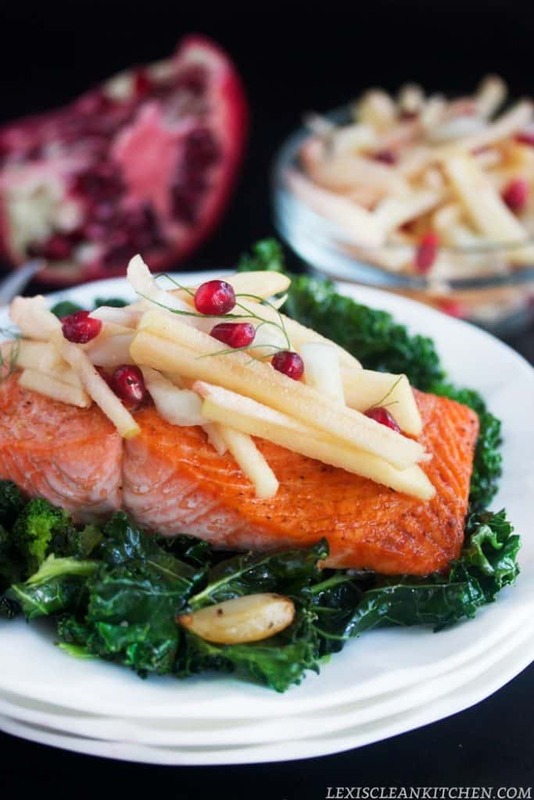 All that, plus… Enter to win a $125 Amazon gift card to support you in your effort to eat healthy in 2015. 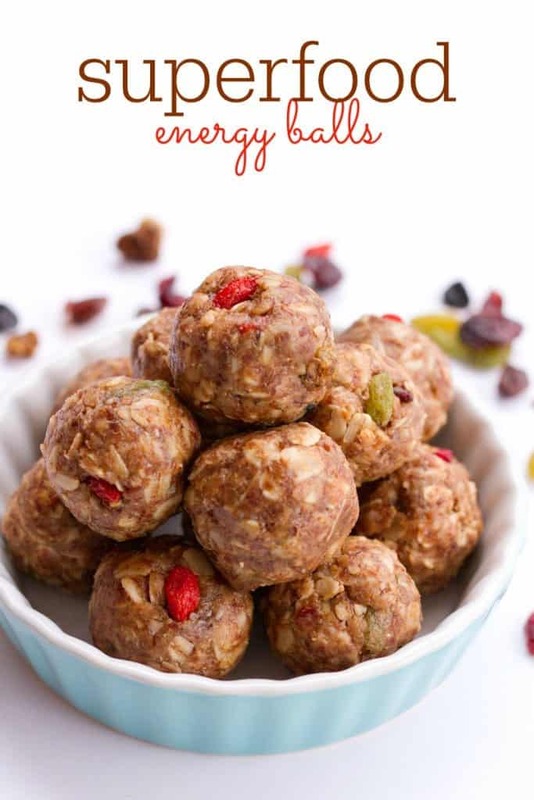 Brittany from Eating Bird Food made you superfood energy balls that have a base of oats and almond butter and are studded with a blend of superfood berries including goji berries, inca berries and mulberries. 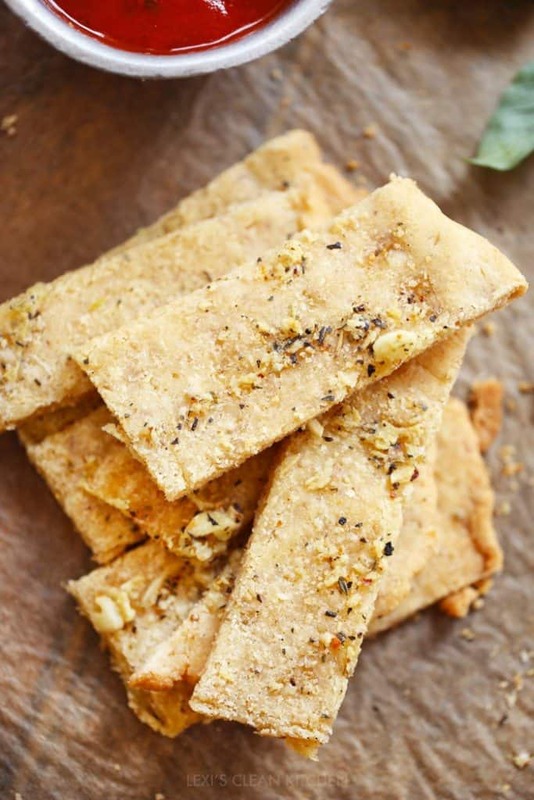 They’re a healthy on-the-go snack option with enough sweetness to satisfy a sugar craving. 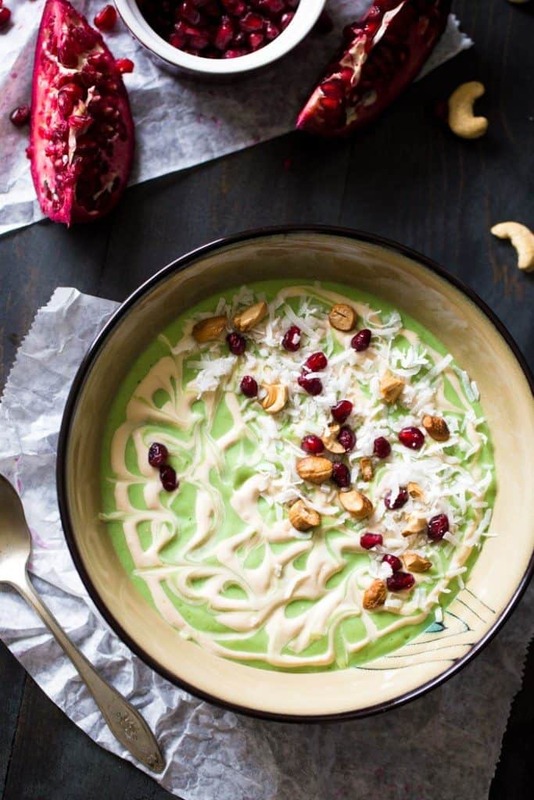 Taylor from Food Faith Fitness made you a protein and super-food packed smoothie bowl that is made extra creamy with Greek yogurt and avocado. It’s swirled with cashew cream for the perfect nutty note. Kelly from Nosh and Nourish made you the most gorgeous juice ever! A large pile of vegetables and fruits becomes one nutrient-loaded glass of juice. 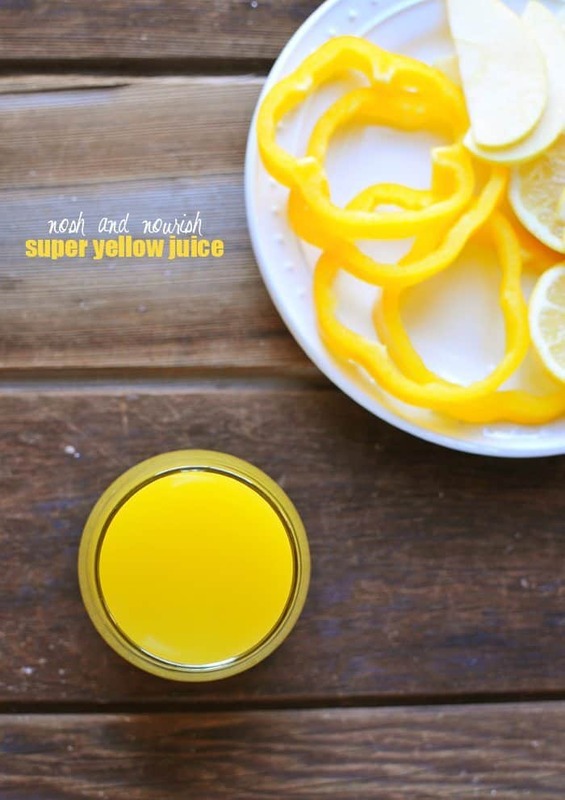 This Super Yellow Juice is overflowing with vitamin C from the bell peppers and rutabega and is great at aiding in digestion and boosting your immunity! 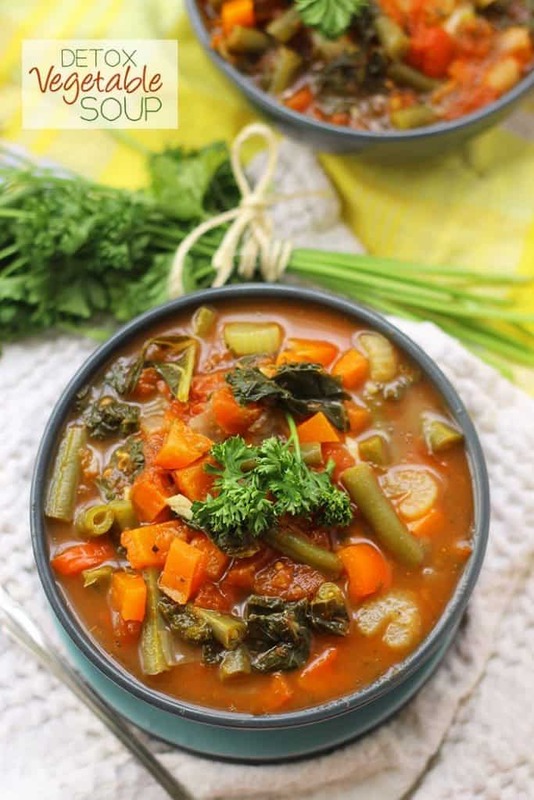 Davida from The Healthy Maven made you a healthy and nutritious Detox Vegetable Soup. 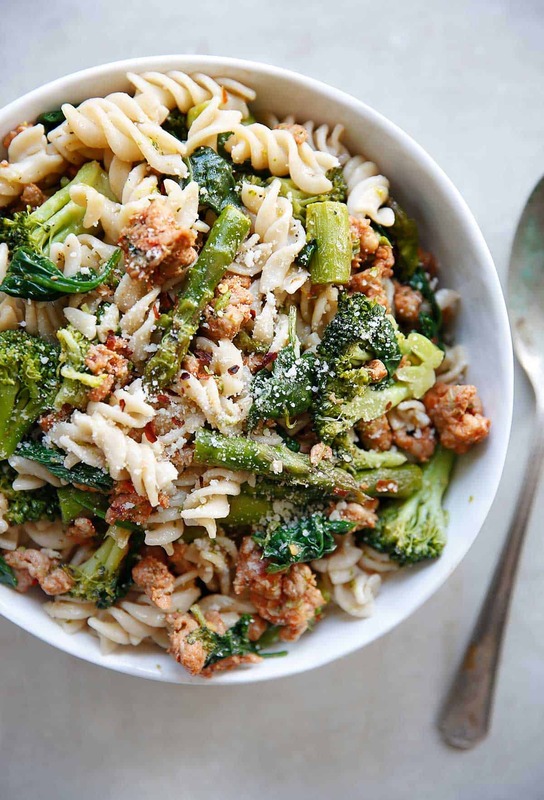 It’s made with eight different vegetables and is ready in under 40 minutes for a hearty and veggie-packed meal. 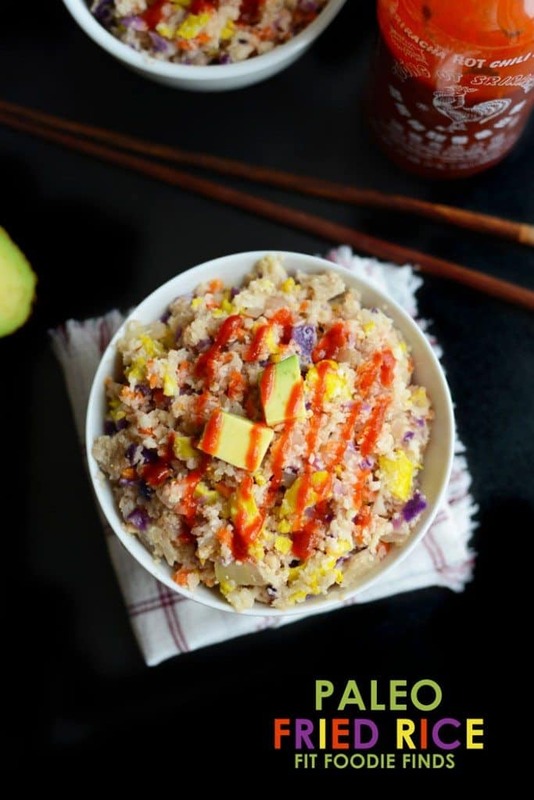 Lee from Fit Foodie Finds made you Paleo Fried Rice using cauliflower in place of rice and tons of veggies for a healthy, quick, 30-minute meal that’s vegetarian and delicious. 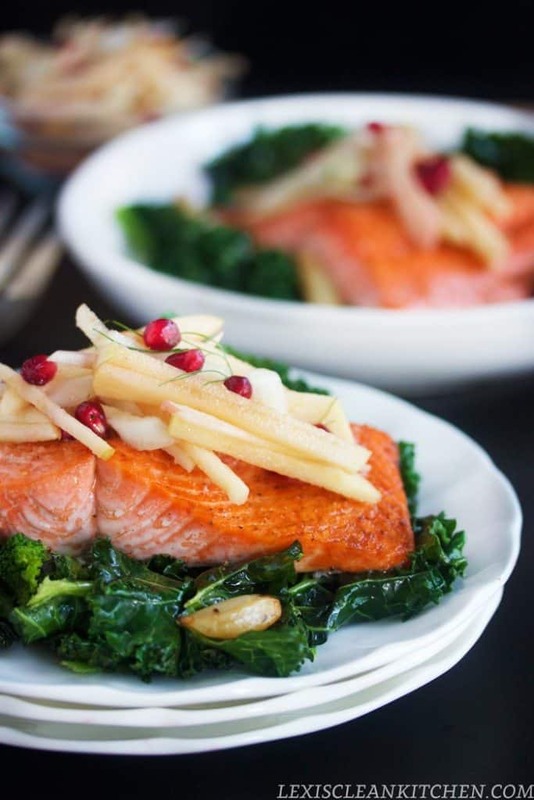 Now, for the salmon dish that is perfect for your weeknight meal or your classy dinner party! 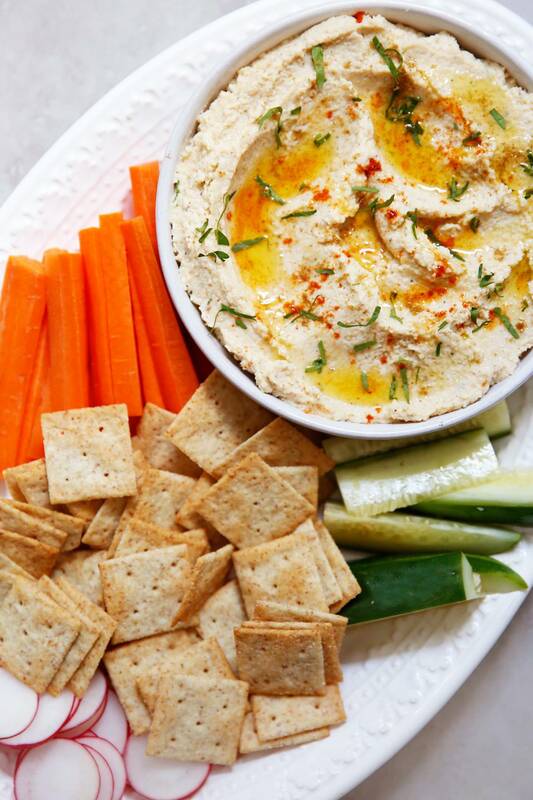 Packed with nutrients, easy to prepare, Whole30-approved, deliciousness! You’ll leave the table beyond satisfied and wanting more, promise! I’ve been topping the apple fennel salad on all of my leafy green salads lately, too! 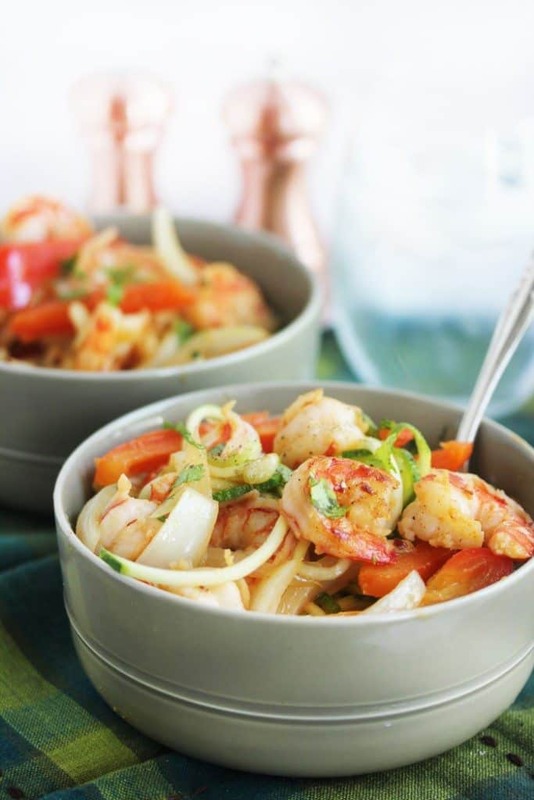 These Cajun Garlic Shrimp Noodle Bowls are the perfect 20 minute meal! 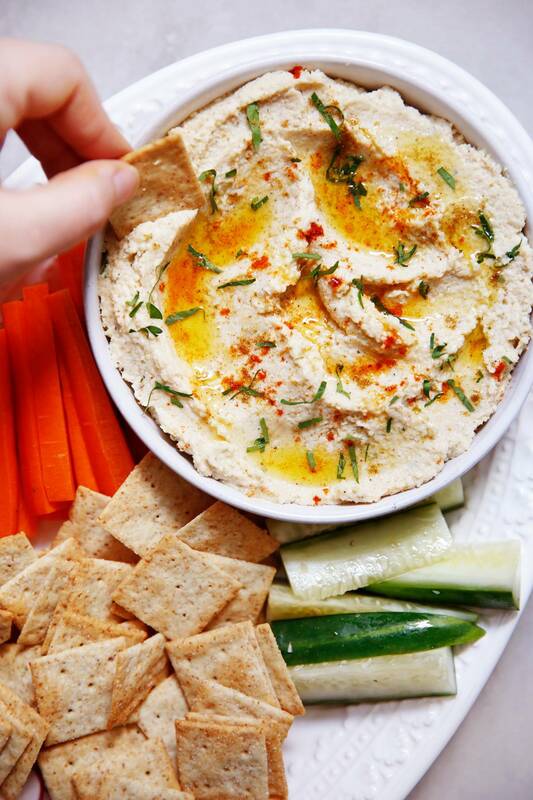 Whole30-compliant, easy, and delicious with a little kick of spice! 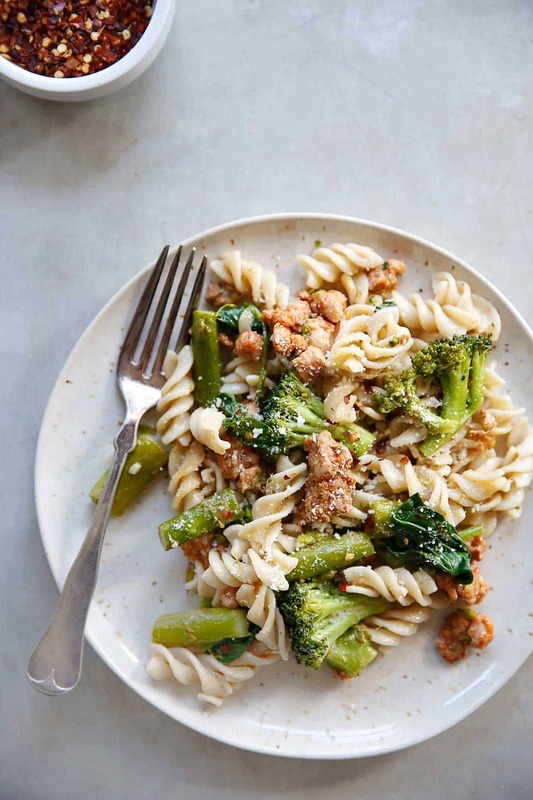 Simple weeknight dinners. That’s what I’m all about these days, along with easy lunches and on-the-go snacks and breakfasts- too! I’m getting the vibe (via my Facebook page), that many of you are in the same boat, too. 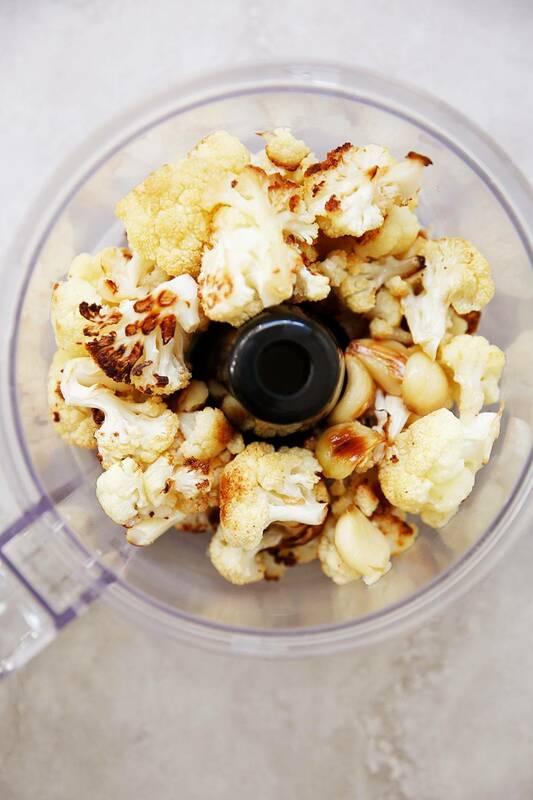 To preface this post: I love my spiralizer. I use it at least once of week and usually don’t stray far from my beloved zucchini linguine. 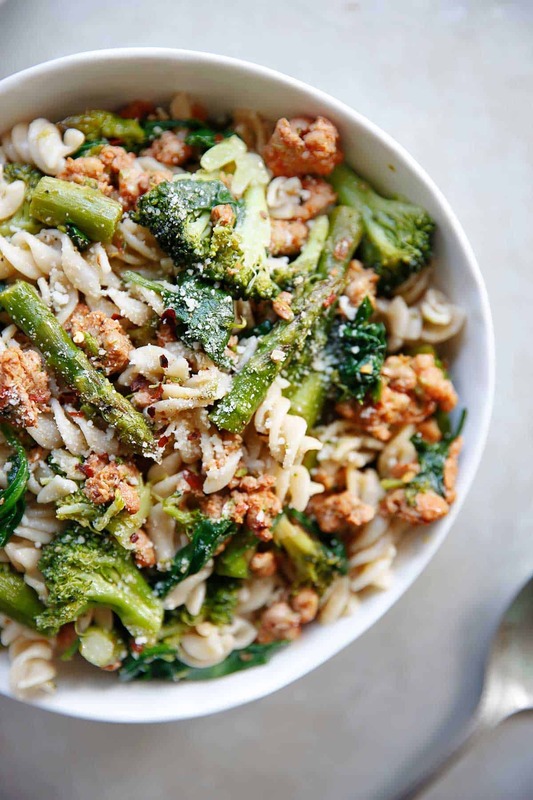 This dish comes together in 15 minutes and can be adjusted based on the veggies you have on hand! 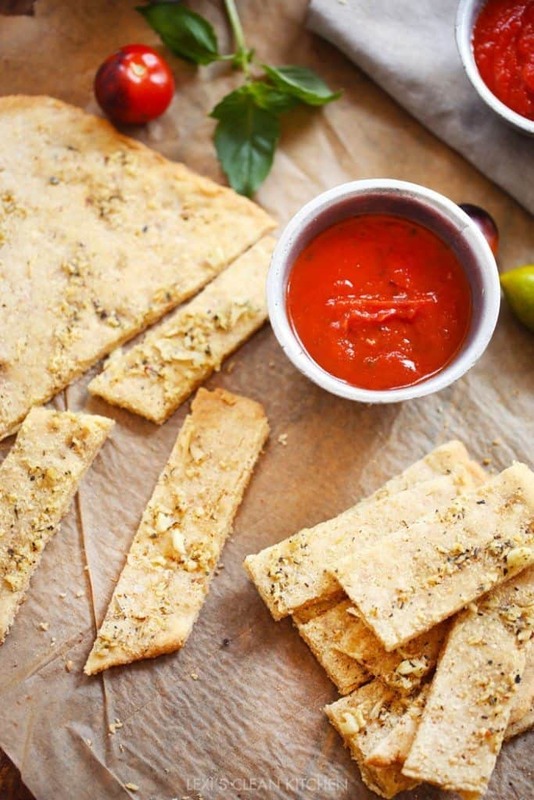 Cajun-y, garlic-y, buttery deliciousness. 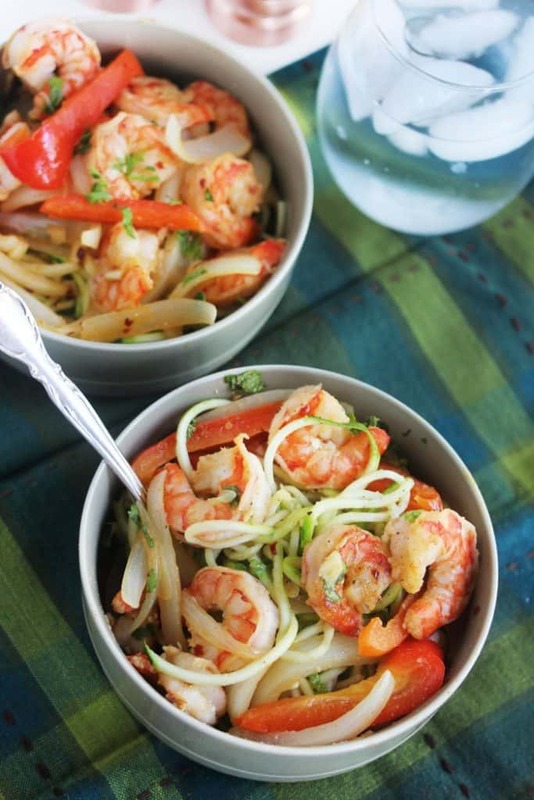 Place zucchini noodles in a bowl and top with garlic cajun shrimp and veggie mixture. 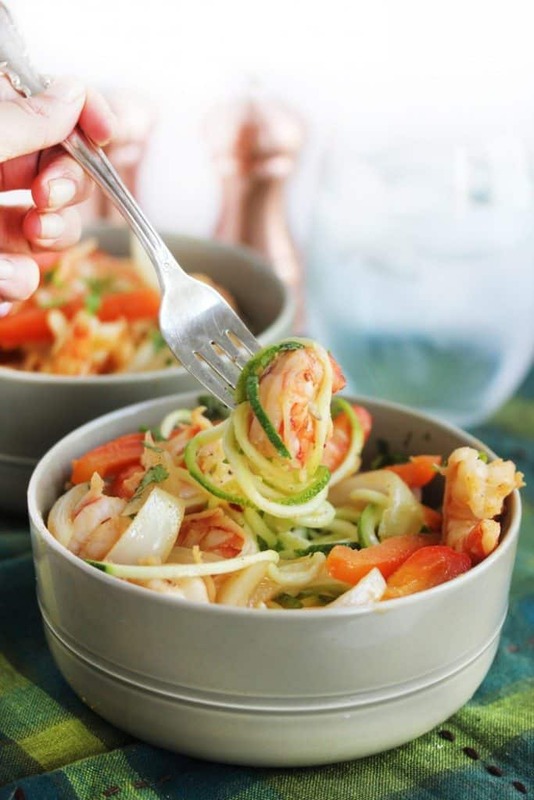 Do you have a spiralizer? 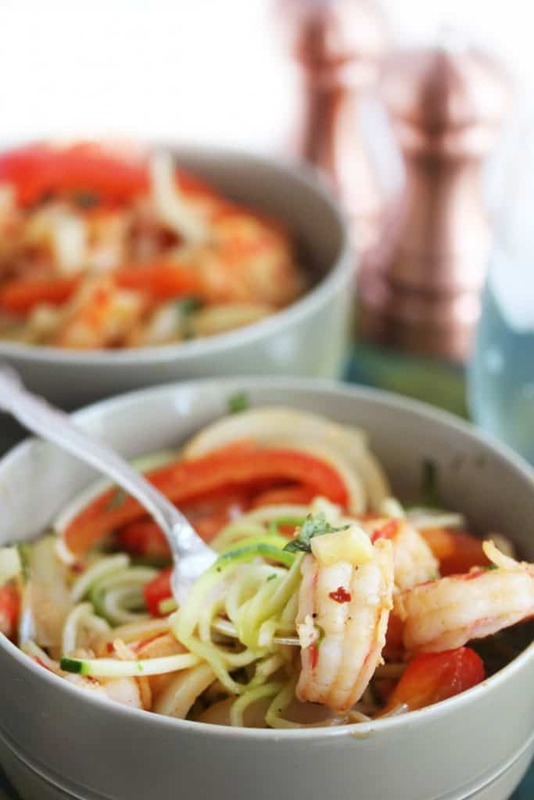 What’s your favorite dish to spiralize?